An easy, if very wet, 12-mile walk around Barden Moor visiting the summit of Cracoe Fell, the Rylstone Cross and two reservoirs. The Barden Moor access area incorporates the likes of Cracoe Fell, Thorpe Fell, Crookrise Crag, Embsay Crag and Halton Height as well as two sizeable reservoirs. There are a variety of walking routes, both short and long, on mainly good paths. This particular route is one of the longer walks on Barden Moor and is one I first did back in 2005. I chose to re-visit this walk for the first time in 12 years as I thought it would be a good choice for the small walking group we’ve formed at work as we prepare to tackle the Nidderdale Way later in the year. The forecast was for rain in the morning followed by showers in the afternoon. However, when we arrived at the small parking area on the minor road from Barden Tower to Eastby it was a quite pleasant morning. Unusually for a walk it started with a descent, albeit a gentle one down to Lower Barden Reservoir. Together with nice views of the reservoir we also had a good view of Simon’s Seat across Wharfedale. As we crossed a footbridge at the head of the reservoir we noticed lots of toads in the shallow waters below. Just a short way further up we came across a couple more on the path itself. 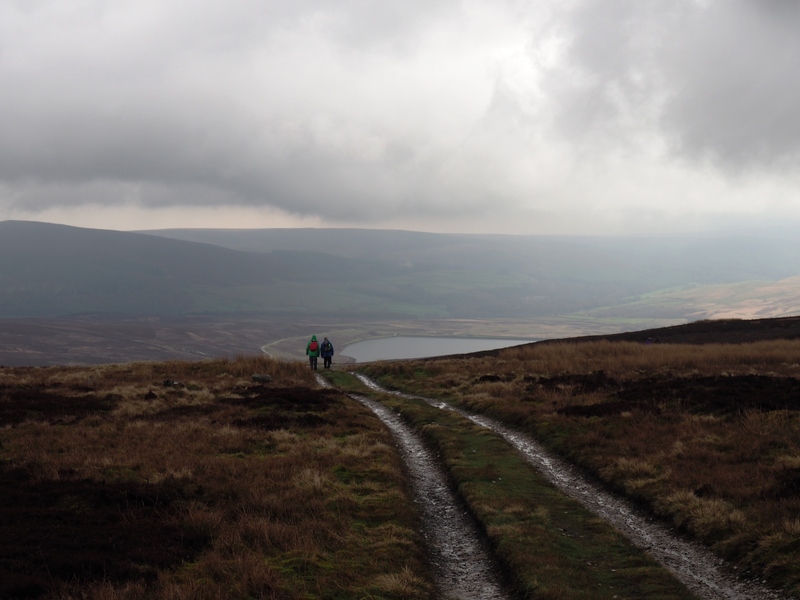 The wide track climbed gradually above Barden Beck to reach the dam of Upper Barden Reservoir. In addition to lots of water fowl the reservoir also seemed to be particularly popular with black headed gulls. From the dam we continued on a good track which contoured around the moor for another mile or so to reach a much smaller reservoir on Gill Beck. Just beyond this reservoir we turned left on a path that climbed up past a chimney. The well preserved chimney is situated next to some ruins which was apparently a boiler house which was linked to some nearby coal mines. Just a short climb up from the chimney we came to the shooting hut on Thorpe Fell and some great views of upper Wharfedale from Grassington up to Great Whernside and Buckden Pike. From the shooting house we carried on heading west along the track. As we did so the first signs of rain appeared in the shape of showers to the north-west of us. So far we’d managed to avoid getting wet but just a few minutes short of reaching the top of Cracoe Fell light rain began to fall. What happened next was quite incredible. Just as three of us reached the crag that the Cracoe obelisk is perched on, the heavens well and truly opened. Within minutes the heavy rain had turned into torrential hail. We tried to wait it out hoping it was a quick shower but only succeeded in getting completely soaked to the skin. After ten minutes it did stop briefly enough for us to get a few photos near the obelisk but then renewed its efforts as we slid our way along the path towards the Rylstone Cross. The peaty path had, in the course of minutes, been turned into a stream bed. Needless to say there was little talking, just the occasional slightly hysterical laugh at our utterly sodden selves. When we finally reached the Rylstone Cross the rain suddenly eased off again. Unfortunately there was little to see from the cross as the cloud base had also dropped at least 150m and we were now enveloped in hill fog. Turning south we soon joined the Rylstone to Bolton Abbey bridleway. Turning left on this we made our way across the moor until just below Brown Bank where we turned off to take shelter in one of the turf roofed shooting huts nearby. After a well earned lunch and the chance to dry off a little bit we made our way back to the track, climbed the brow of Brown Bank, and made our way back to the start. With the rain now gone and the cloud lifting this final few miles was hugely enjoyable with great views back down to Lower Barden Reservoir and across to Simon’s Seat. Put into context it only really rained on us for about a mile and a half, which considering this was a 12 mile walk was not bad. While it is a shame it happened at arguably the most scenic stretch of the walk the experience of getting so wet so quickly was in itself quite memorable!